Good point, but if advertised as a certain condition one would hope that is the case no matter the price. But for $350 I was expected something in better condition. Progress...... Today I got the engine to turn by hand 360° and keep turning, only one problem the Suspect valve doesn't go back down on its own. I have to "bop" it down every time, e Even that after taking a closer look at the engine it looks tired and worn out. Maintenance on it looks like it was non existent all full of burnt oil and real bad sludge cylinders look like they need some love. But on the other hand I did receive an email responses from the seller asking me if I used any penetrting oil before i took anything apart and that his phonewas "buggered" and will call me this afternoon after he fixes his phone, we'll see what time he calls. Thanks for the advice guys. I'll give this guy till Monday to respond, after that it's with both barrels that I'll be using. I'll call him out on the H.A.MB. Well I do have the other engine (218). Just wondering how all that would work. I know I can use the head intake and exhaust manifolds, and all other exterior components except for the starter, that has to match the flywheel ring gear. I have Marvel Miracle and have been putting in the cylinders and letting it soak through. What I'm really trying to stay away from is pulling apart the crank and valve train. Is there anything else I should be looking for? Before I tear it all apart or tear it up. . . .
A couple different things can be happening here. The adhesive used for the oil pan gasket could be holding you up.. Or the oil pick up tube could be binding you up too. Try bumping the pan with the heel of your palms. Or wiggle the oilpan around. Suspect found..... I disconnected the throttle linkage like suggested. (GregG) it still idles high. so I swapped the old linkage piece (non Overdrive) for the new overdrive kickdown linkage piece. Rpm come down to a regular speed. Any suggestions to correct this? Where? I double checked and triple checked all screws and nuts. I even did figure 8's on wet fine sand paper to all flat surfaces weed out ant warpage. I also tried with the vacuum line on and off, and plugged the vacuum fitting at the bottom. Should I try the thicker carb base gasket instead? Greg, I will look into that, I did something similar but instead just removed the carb return spring. but that only made the linkage open up the butterfly. I thought about that this morning.... so I lengthened the linkage a bit. But may be I can give it more length. So the last few weeks I have been working on installing my new O.D. Opened up a can of worms. Clutch pressure plate was cracked, pilot bushing was a project to remove, rear axel seal blew out prior and ruined brake shoes, in the mean time I also thought my carb needed a rebuild since it was last rebuilt about 7 1/2 years ago. Besides the trans swap, relays, switches and o.d. wireing harness and new clutch. Nothing else was changed or adjusted. Now after the carb rebuild I cant get it to Idle right. air screw is all the way in idle speed screw is out not touching and it still idles high. 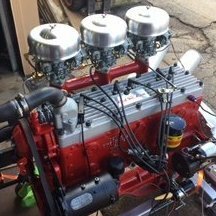 52' Plymouth 218cid bone stock Points ignition Carter BB single barrel Float set 5/64 Accelerator pump 3/8. What am I overlooking or doing wrong? My man Young Ed! Thank you. I will look into it. My main concern was compromising the rubber , and this link has my answer. I just bought a rear main seal looks NOS. Both have cosmoline and would like to know whst solution to use and not affect the rubber, and deteriorate before it wares out. 218 cid. "I talked to George Asche the other day, He didn't know how it would work it, but recomended not to try it." George Asche is not the PETRONIX tech. He is a shop owner who rebuilds O.D. transmissions and engines. Weather Striping and Window Gaskets?